The Pontianak. Photo source unknown. It's Halloween again, so my contribution to this festival is a post on The Langsuir. 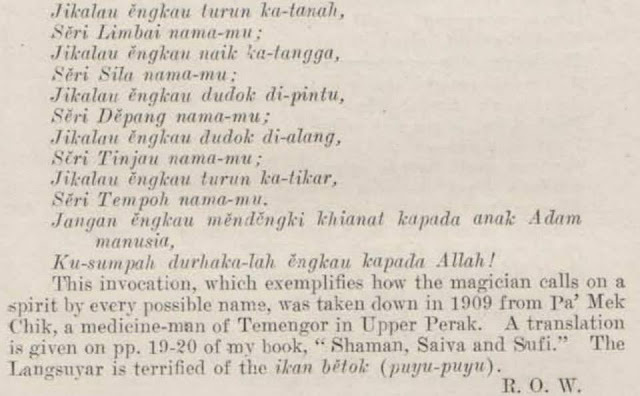 The Langsuir is a vampiric revenant in Malay folklore. 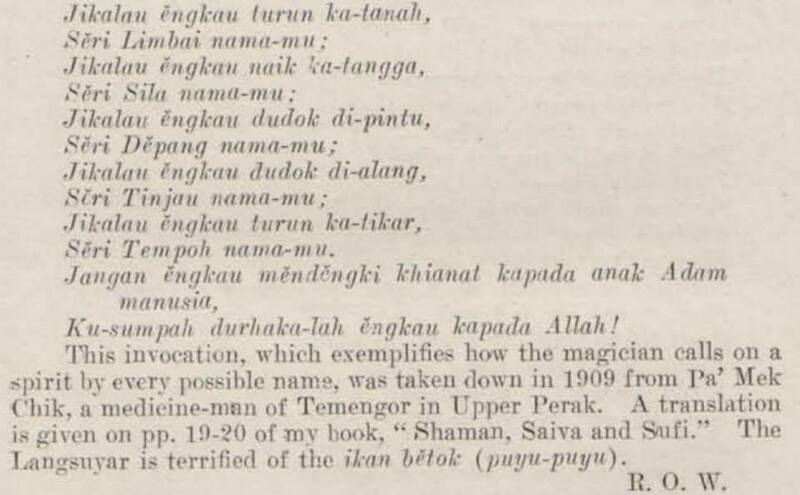 According to Carol Laderman (Wives and Midwives: Childbirth and Nutrition in Rural Malaysia), "The langsuir or pontianak is a vampiric creature who was once a woman. She takes on a demonic form after dying from childbirth." The death could be due to a difficult childbirth or to the shock and heartbreak resulting from having a stillborn child. 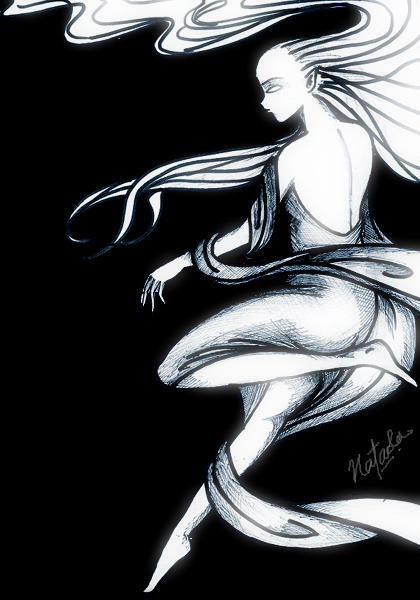 In the past, women in rural Malay communities, who are about to give birth had to be protected from malevolent spirits such as the Jin Tanah (Djinn of the Land) and Jin Hitam (the Black Djinn). "They are attracted by the sweet blood of parturition, dripping through the floorboards to the ground below. The 'dirty' blood of menstruation does not appeal to hantu and small amounts of blood from wounds are beneath their notice, but a great deal of blood lost during childbirth... may prove irresistible." Even more terrifying than these supernatural creatures are the once human revenants. If the proper rituals are not followed, forty days after death, the deceased will rise up as a langsuir or a pontianak. If the child died with her, then it too will come back in úndeath' as a blood sucking infant vampire called a toyol. According to information gleaned from the Internet, to prevent a woman from rising as a langsuir, glass beads (glass marble?) must be placed in the corpse's mouth, a chicken egg placed under each armpit, and needles stuck into the palm of each hand. I tend to disagree about the interchangeability between the langsuir and the pontianak. I think the langsuir is created when an unmarried woman dies an unnatural death. Like the Yakshi of South India and the vampire in Western culture, she most likely took her own life or was murdered by a lover. The langsuir does not have fangs like all other types of vampires; instead, it drains the blood from its victims through a hole at the back of its neck, which is hidden by its long black hair. One can only speculate that there must be a tube like structure which comes out of this hole! This creature has been described as having very long fingernails and commonly wears a green or white robe. By night, the langsuir shape-shifts into an owl and then flies out seeking its favorite prey, children (according to certain bloggers). Children are not easy prey to find because most of them will be indoors before sunset. Unless that is, they have a wicked stepmother who makes them draw water from a well after dark! I rather think the langsuir is looking for men; it's the pontianak who seeks women about to give birth and their after-birth. These are vengeful spirits drawn to what they longed most in life - the langsuir wants to be wedded and the pontianak wants to be a mother. But their demonic nature and blood lust have twisted them. As it flies, the langsuir occasionally lets out an eerie wail known as an ngilai; which will strike terror in the hearts of the bravest person. By day it can be found sitting in trees or by a river catching and eating fish (I also have doubts about this odd piece of information). Here is an invocation to summon the Langsuir by R. O. Winstedt. Why would anyone want to summon a langsuir? According to folklore, the langsuir can be captured and domesticated. And the 'tamed' langsuir makes for an incredibly beautiful wife and a devoted mother; this domesticated vampire wishing for nothing more than caring for her family. So there might be men out there who are arrogant and foolish or desperate enough to embark on such a course. However, they should beware, because if the langsuir is allowed to dance or show any signs of unbridled happiness, she will revert to her bloodthirsty and murderous ways. Once this happens, she must be re-captured. According to some modern bloggers, her hair and fingernails must be cut off and stuffed into the hole at the back of her neck. This will force the langsuir to change back into a mortal woman. This bit of information from the Internet is, of course, complete rubbish. I remember reading as a young adult that there is only one way of trapping a langsuir. Just like the yakshi, her weakness is iron. Placing an iron nail or spike at the back of her neck will change her into a mortal woman. Carol Laderman, mentions this as well. The best way to banish a langsuir is "piercing the demons neck with iron or steel while repeating the appropriate spell." According to folklore, one must never remark upon or mention this fragrance, should one come across a mysteriously sweet smell while walking in lonely places at night. Because this is tantamount to an invitation to a langsuir! The best thing to do is to leave the place as soon as possible! Disclaimer: The administrator of this page is not responsible, should any harm befall anyone as a result from uttering this invocation out loud.